THE promise of awesome worship. That’s what got me rocking up to a Planetshakers meeting. And I wasn’t disappointed. They said ‘‘awesome’’ 20 times. Planetshakers is a megachurch, which is like a spiritual mega-meal deal. Pizza, Coke, chocolate bavarian. If we could masticate it for you and pump it into your stomach, we would. Because we love you. And so does Jesus. It was the first time I’d been excited about going to church. I spent every Sunday of my first 18 years sitting on wooden pews listening to a bloke talking about his imaginary friend in the sky who did magic tricks. Women were virgins, saints or whores. Men were the Father, the Son and the Holy Spirit. Outside Planetshakers it felt as if we were about to see a rock concert. And we were. As the band fired up and went off like a frog in a sock, I thought: "I don’t care what they’re selling but I’m buying it." Christian pop, ’80s power anthems, Metallica meets Cheap Trick. A mosh pit for Jesus was jumping with teenagers in rapture and a balcony of Planetkids went off for Christ. Music blared from the stadium sound system while the screen seduced us with slick videos edited so fast the phrase ‘‘subliminal image" kept popping into my head. Lyrics flashed up: "Come like a flood and saturate me now." I wondered what Freud would have made of the disproportionate use of such words as ‘‘come’’, ‘‘touch’’ and ‘‘feel’’, and the phrases "move within me" and "being filled". My favourite was "King of Glory, enter in". Sexual psychoanalysis aside, the Planetshakers are clearly awesome, with lyrics such as: "How can I explain the way u make me feel ’cos Jesus your love for me is so unreal." Several references were made to not being ashamed of Jesus (despite no one having suggested they were). The room was buzzing with anticipation. I felt like a kid expecting Santa to arrive. It felt as if Jesus was going to turn up any minute. Then out came the pastors. Middle-aged blokes peppering talk about Jesus with constant references to the footy, reality shows and McDonald’s. Almost swearing with ‘‘flipping angry" and "What the heck?" and plenty of ‘‘awesomes’’ thrown in to convince everyone they were down with the youth. A pastor banged on about sacrifice and said it wasn’t important how much we sacrificed just as long as we gave as much as we could. No matter how small it was. I didn’t know what he was on about until the giving cards came round. And a little bucket for coins. No lid with a slot. A big open bucket, so you could be shamed by your paltry donation. Then there were the plugs for the Mighty Men’s night and Beautiful Women Seminar. Male volunteers were encouraged to get involved with the ladies’ seminar with the promise of ‘‘being able to tell 3000 women what to do’’. Beautiful women. Mighty men. Note: not mighty women and beautiful men. Then the headline pastor came on, all charisma and awesomeness. He spoke of worship, sheepgate, building in salvation, sheepgate, sacrifice and a bloke called Eliashib. And more sheepgate. As people yelled, "Yeah! ", "Amen!" and ‘‘Awesome!" I wanted to yell, "I don’t get it". I love the way religion convinces people by making things deliberately incomprehensible and you feel too shy to say ‘‘I don’t understand’’ lest you reveal your stupidity. After ‘‘sheepgate’’ the pastor asked us to close our eyes and bow our heads. He urged people who had left Jesus, had never had him in their heart, or were confused, to raise their hands so they could be prayed for. He sounded like a real estate agent. "One over there, thank you, sir. Anyone else? I’ll wait a few moments. Yes, one down the back." Dummy bidders anyone? Then bewildered-looking new disciples were led out by the old hands. The crowd left believing they had been moved by God and touched by Jesus. They hadn’t. They had been seduced by slick video packages and had their emotional desire for love, community and certainty met by manipulation. It wasn’t the Holy Spirit; it was just people. 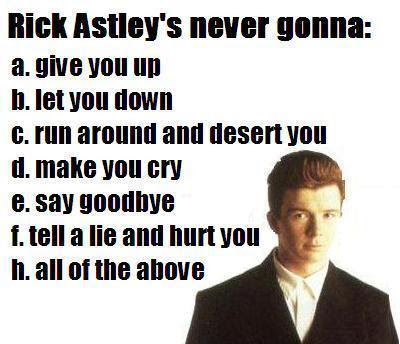 You might as well be Rickrolled, the promises are the same.